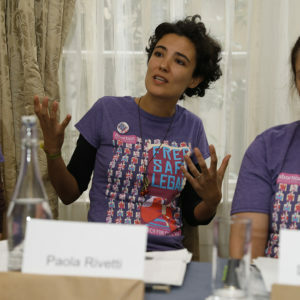 My name is Paola Rivetti and I am a member of MERJ: Migrants and Ethnic Minorities for Reproductive Justice. We formed some months before the referendum with the goal of bringing the voices of women of migrant or ethnic minority background to the centre of the public debate on the referendum because we are exponentially affected by the Eighth Amendment and the ban on abortion. Although we won the referendum together, the struggle is not over because we are still waiting to see what the law will look like. In talking about this, the experience of migrants can be very helpful because we all come from countries where there’s some legislation on abortion; our experiences can help shed light on the dos and the don’ts. We can learn a lot from Italy, and I do not mean this in a positive sense. The experience of Italy demonstrates that conscientious objection must not be included in the law if we really want to make abortion accessible, safe, and free from moral judgement – which is what the people voted for in May. The experience of Italy also demonstrates that we don’t know what access to abortion will look like in thirty years. No matter how many administrative obstacles are in place and how strongly you discourage objection, we just cannot predict what access will look like in the future. Italy voted to decriminalise abortion in 1978 and the referendum was passed by large majority. Four years earlier, another referendum legalised divorce. There was a wave of progressive politics in the country, so nobody thought that conscientious objection would be an obstacle to abortion access. In fact, it wasn’t an obstacle for a long time, but forty years after 1978, this is the situation. The reason why we have such a high percentage of refusal of care is neither religion nor cultural conservatism. In most cases, it is rational calculation about career progression, especially among doctors and surgeons. The self-reinforcing, vicious circle dictates that if you work in an environment dominated by objectors, but you are willing to perform abortions, then you’ll spend your days doing only one thing. And this is usually not good for career progression. We marched in September because we need a law to protect our rights in the long term. We have waited for decades. We have already paid physically and psychologically. We want to be treated as human beings. In May, the people voted to give access to abortion to every person who may need it. We want a legislation that reflects this vote and respects this will. Allowing conscientious objection is the opposite to free, safe and legal.